So these are love songs. 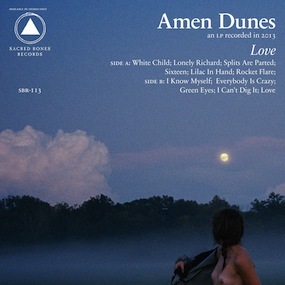 That’s what Damon McMahon – the factor and force behind Amen Dunes – says, and I think I believe him. It’s an audacious move to name your biggest, boldest artistic statement after one of life’s biggest, boldest mysteries. But McMahon has one thing and one thing exactly on his side: He knows that love is a mystery. And he’s built his Love around that mystery, not so much painting the warm blush of first-love feelings as he is pawing at the dimensions of the strange and confusing space a person begins to inhabit when they realize that their identity has begun to merge with that of another. As with most mysteries, it vanishes with articulation. And so across Love’s 49 minutes, it’s frequently impossible to tell what McMahon is saying. Not in the figurative sense, as if his lyrics were simply inscrutable (though they often are); I mean that he literally sings as though he has a half-chewed baguette in his mouth. When he sings the line “Moved to free house with violent people” in the second verse of “Splits Are Parted,” it comes out sounding like “Moota tea gow vi-o-lent people.” But instead of being annoying, which it very well could be, McMahon’s slurring is strangely disarming, even touching. He frequently sounds stupefied and confused, and he continues to plow forward through his lines. When he does it well – and more often than not he does – McMahon captures the twinned feelings of fear and exhilaration; it’s the soundtrack that plays as you walk nervously from a life of comfortable solitude into the bright and revealing lights of another person. McMahon recorded Love in Montreal with Godspeed You! Black Emperor’s Efrim Menuck and David Bryant, and both journeyman avant-sax player Colin Stetson and Iceage singer Elias Bender Rî¸nnenfelt make multiple appearances. McMahon recently told Wondering Sound that he took the session’s tapes home to New York, where he “boiled it down to its core elements.” But that metaphor doesn’t quite feel right; Love isn’t nearly so boney. Instead, it’s as if McMahon spilled tea on those Montreal tapes and captured the sound before it all had a chance to dry. The mix retains much of the dark, gauzy texture you’d expect from a folk record associated with the Godspeed crew, but in toning down his collaborators’ contributions, McMahon changes the color palette, if not the composition itself. He draws out shades of twilight blue, checks out for a few hours, then wanders back outside for stark white dawn light. “I Know Myself” opens in Jim James’ old silo but soon grows too big for those confines; the soundstage widens, cooing backing vocals come in, someone plays a shaker, and the song trades its late-night ruminations for a group exhortation. Earlier, in “Sixteen,” the multi-tracked pianos begin to slip apart just enough to mark them as distinct recordings, though they still manage to carry the song together. It’s a near-perfect representation of the lost lovers slowly drifting apart depicted in the lyrics. Which isn’t to say that Love can’t be a frustrating listen at times. While McMahon’s strange vocalizations are heartbreaking when they’re surrounded by the trickling guitar and percussion that makes up much of the record’s sound, they feel comic and overbearing in “Sixteen”’s austere setting. On side two, Menuck and Stetson both plow against his scattered rhythm lines in “I Can’t Dig It,” but McMahon buries much of the song’s action far below the surface. That gamble actually pays off when the song gives way to its bongo-punctuated bridge, where he sings “I know you think ‘Just kill me’/So stiffen up and do it” over Stetson’s subjugated hoovering. It’s the right move, but you can’t help wondering at the terrifying potential of those raw tracks. Then again, McMahon’s willingness to trust his intuition is what makes the record work. Just before that indecipherable line in “Splits Are Parted,” he unfurls a long, steady, and clear “Oh, I could love you” over ascending guitar lines that seem to tremble as they’re drawn. And “Everybody is Crazy” reveals itself over a gentle, wandering melody that McMahon guides down to a full stop on the chorus. Though well-constructed, both songs – and the record as a whole – play out patiently, unwinding with a kind of inevitability. Steel guitar lines cascade from standout “Lonely Richard” in a sluice, gaining in meaning and resonance as they travel through the song. Love this a bunch. Great stuff, Marty.